There are very few products out there that I think are so great I end up buying them for my entire family. 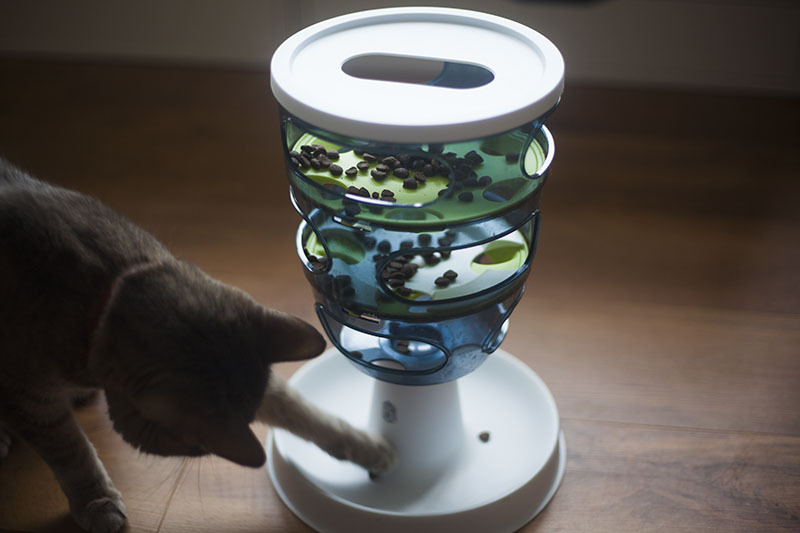 The Catit Senses Food Maze happens to be one of them. 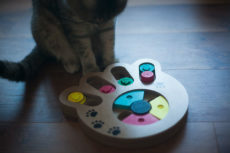 We got our first Catit Food Maze a long time ago; something like three years ago. 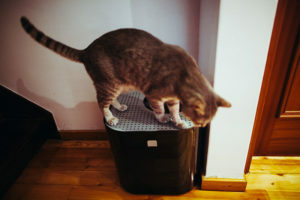 Since then, we’ve bought one for my parents, given an old one to my brother, then re-bought one here in the UK for ourselves (we moved continents early 2016, and a cat food maze isn’t exactly the kind of thing you take with you in a suitcase). 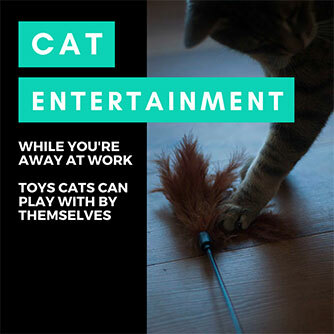 In case you can’t tell, we’ve gotten a lot of good use out of this product over the years, and expect it would be the same for other cat owners. Does the job we wanted it to do just right. 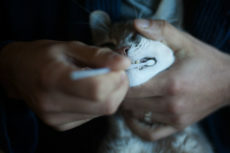 I prefer feeding Avery kibble over wet food for a lot of reasons: according to some vets, kibble is healthier for a cat’s teeth (edit: did some research and found out this is actually not true; read up on it here), kibble is easier to store than wet food, a lot cheaper than wet, even for quality kibble, easy to involve in play-time, helpful in specific attempts I make at making Avery exercise more, and the last and most important reason – it allows me to feed Avery solely through the use of cat feeding toys. Which I feel in itself has many advantages. 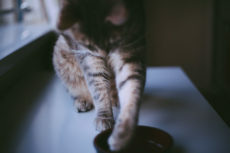 If kitties eat too quickly, they can end up overeating, with indigestion, or even vomiting. 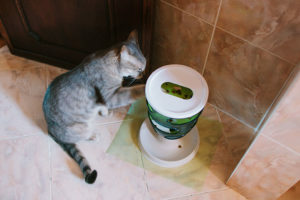 Now, Avery had never vomited prior to me grabbing the Catit Senses Food Maze, but he was a quick eater, and so I didn’t want him to end up having issues later on. I wanted him to slow down. Putting food in a bowl and just handing it to him wasn’t going to cut it. 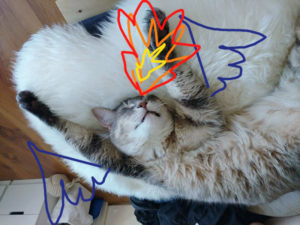 He’s an indoor cat and always has been since we took him in – so I also was searching for a way to keep him engaged with something other than nap time for part of the day. Yes, I played with him, but I couldn’t help feeling it wasn’t enough. 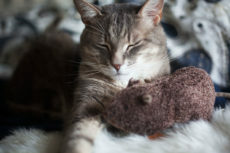 He’s not the kind of kitty who likes to play on his own, but put food at the heart of the “game” and he’s definitely in. So food toys definitely seemed the way to go. 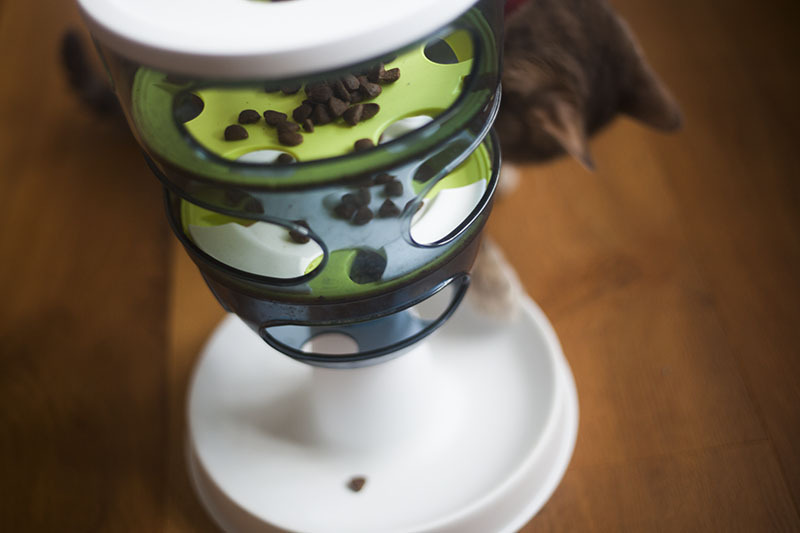 The Catit Food Toy caught my attention primarily because of all the positive reviews it was getting on Amazon – and let’s be real, also because of the pretty reasonable price tag (especially by comparison to timed feeders). I figured I should give the food maze a shot and hope for the best. 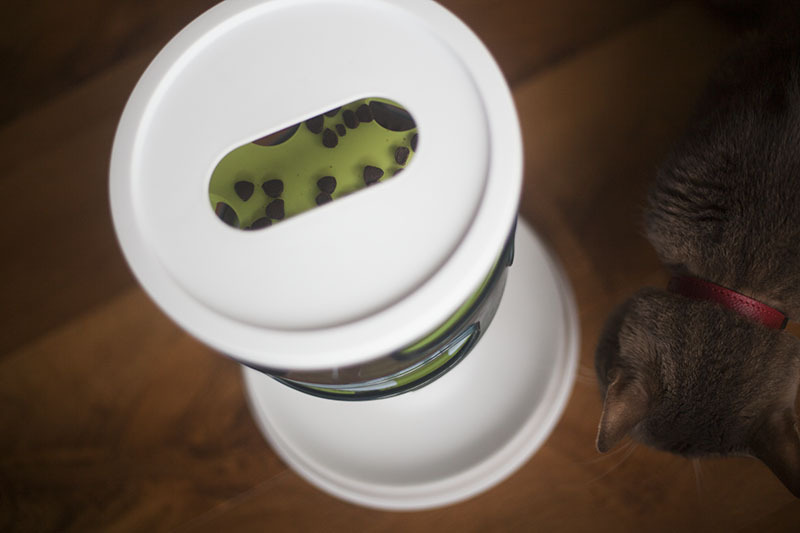 This wouldn’t be the first cat product to disappoint me if it did, and so long as I ended up with at least a few products I really liked, I’d be happy to cut my losses. The price of this product is very fair, too, if you factor in using it every day and the fact that it can easily be taken apart and washed clean. 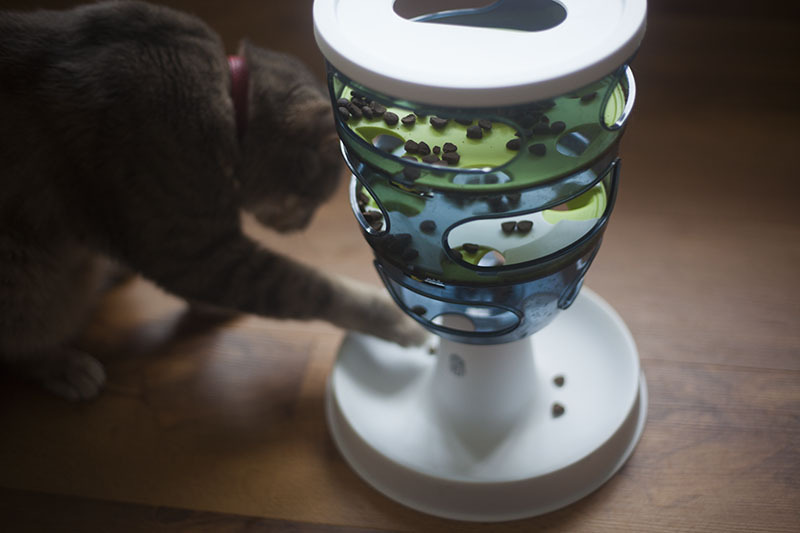 If the Catit Food Maze worked out, it would be more than worth the price. Remember how I told you we got this food tree a long time ago? 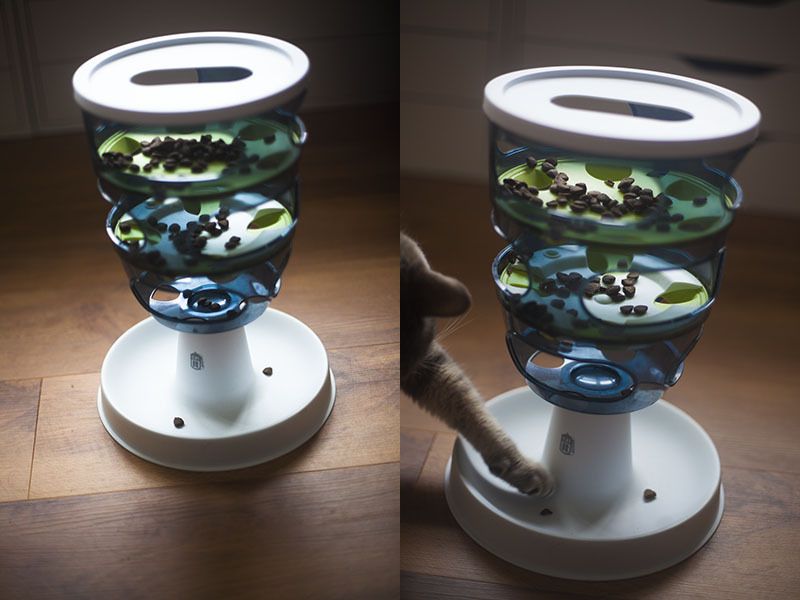 This was way back when Catit had released the first version of the toy; Catit is now on to version 2.0, which has a much more narrow opening at the top, and a wider base. Not huge differences, but I can definitely see why they made them. I’ll touch a little more on this later. When we first tried out the the Catit Food Maze, Avery was a bit confused and didn’t really understand how to get the food out. Fair enough, considering it was our first ever food toy for him (have tried many since, though!). I don’t recall now if I had to demonstrate with my fingers pushing the food down or if he ventured a try himself without any prodding, but he got the gist of things that first day, and while it took him a few hours to get nearly every last piece out (I flipped the food toy over and gave him the last 2-3 pieces myself), you could tell he was going to start speeding up his eating once he’d hacked the thing. And hack it he did. 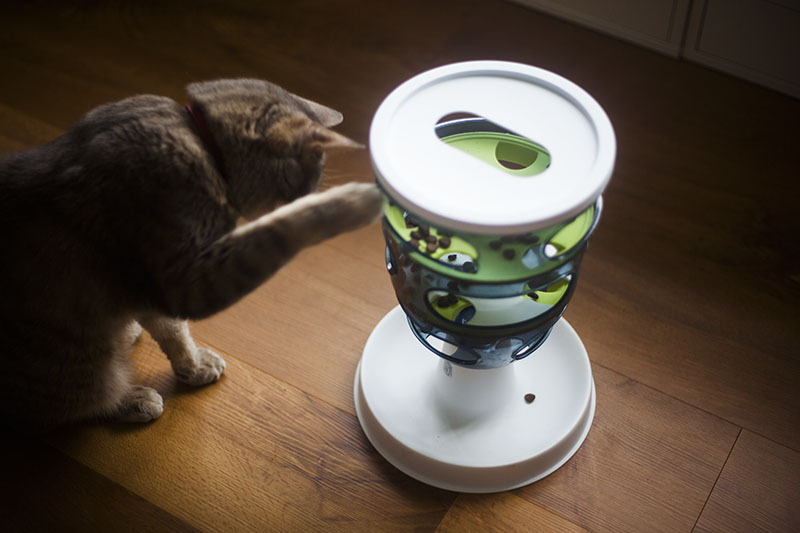 See, that giant round hole in version 1 of the food maze meant that he learned a week or two in that he could put his paws up on the top of the toy, stick his head through the hole in the top and eat away. 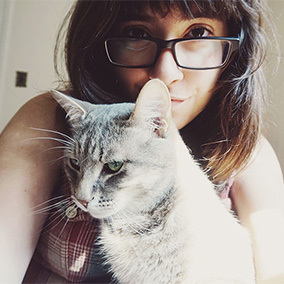 Naughty little bug. Not an issue for us, though. Had plenty of big, heavy books lying around – simply laid one on top after dropping the food in and he was easily kept outta there. Avery didn’t try knocking the book over or pushing the whole food tree to the floor, which meant this one quick fix was all it took to solve all our problems with version 1 of the Catit Food Maze. The first version also had this odd little mat that would be placed underneath the maze to try to keep it in place. Didn’t really work, so we chucked it, but we didn’t care if the food maze moved around anyway. If the food maze wasn’t on carpet, it would start off at one end of the room and easily end up about half a room’s distance in the span of one feeding. Again, not an issue for us, didn’t really care if it moved around, so long as it wasn’t knocked over – and luckily for us, Avery never did try for us to find out. Maybe that had something to do with the heavy book on top, though I doubt it, because we eventually took that off and he didn’t try any funny business then either. In fact, didn’t even go back to eating from the top. I guess he just got used to getting food out the “regular” way which made it less work than his shenanigans. Avery learned how to eat all his food out of the Catit Food Maze in a matter of about 20 minutes. 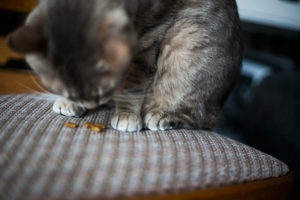 Considering this was our first cat toy and we’d been feeding him out of a bowl prior, we were pretty happy with this considering it meant he was eating slowly enough not to be able to vomit from eating too quickly, and it meant he felt a bit fuller since it took him longer to eat every last piece. 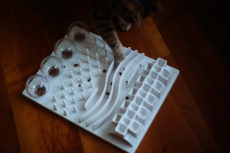 The Catit Design Senses Food Maze technically comes on three settings – easy, medium, and hard, but I’ve only ever kept it on hard, really. 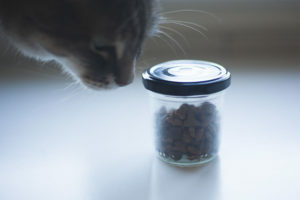 It’s not that difficult, and anything easier is, in my opinion, not even worth using since cats can finish a whole meal within 20 minutes even when it’s on the hardest setting. 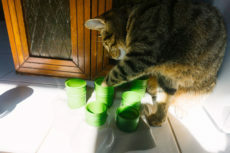 It took Avery a while to get used to inspecting the food maze for stragglers, but in no time he learned, too, that those tough pieces to find were pretty easy to get out once you’d sniffed them out. So I stopped having to flip the maze over at the end of feeding time to give him remaining pieces, as there never were any. At first, Avery would actually eat his food as quickly as he possibly could. Over the years, however, I feel as though using this food maze has actually taught him it’s okay to slow things down. Around 2 years ago, he was taking around 40 minutes on average to eat his meals every night – a significant improvement from the original 20 minutes! For the past 6 months or so, he’s been taking around an hour to an hour and 20 minutes to finish his meal, in my opinion, because he no longer feels like he has to rush. All in all, an excellent product that I feel has delivered in spades. It’s done its job of slowing down Avery’s eating far better than I could’ve imagined – taking him 20 minutes to finish food initially, and once getting him into the habit of eating much slower, helping to get eating meals slowed down to over 40 minutes, even up to an hour and 20 minutes of play in recent months. 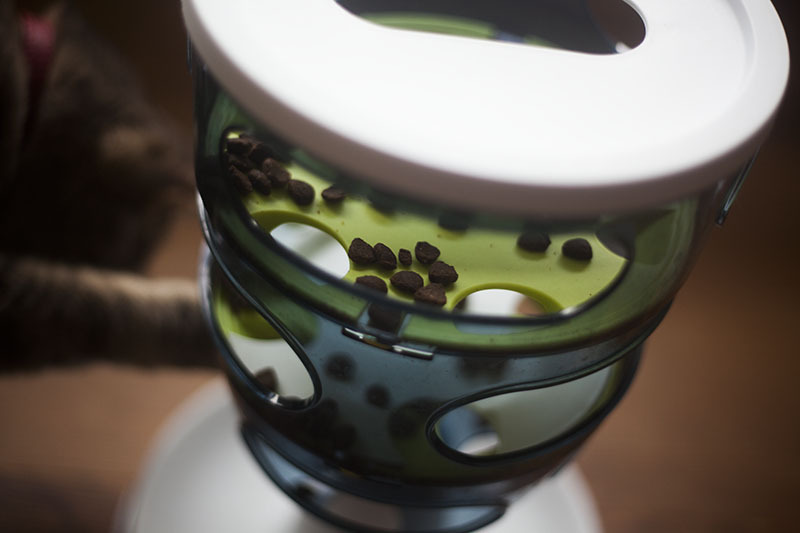 He’s really learned to take his time with his meals, and it’s certainly a big part thanks to this contraption. 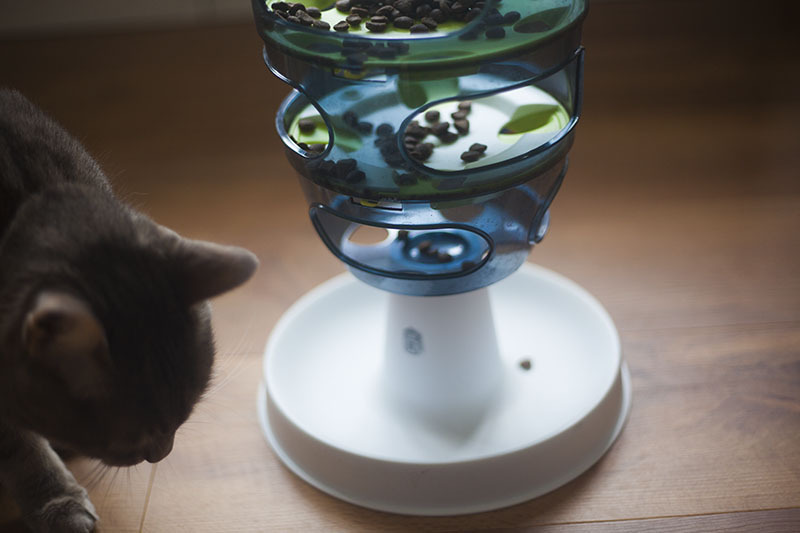 Never regretted getting the Catit Senses Food Maze. 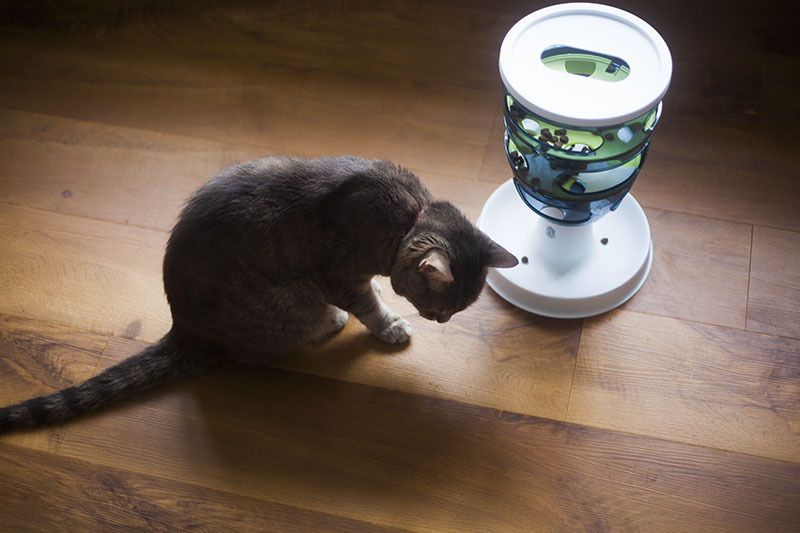 Have used it with Avery for roughly 3 years, and as I’ve said, I’ve even gone so far as to buy three of these over the span of the last few years, two which I gave to family members so their cats could benefit from it, and one for Avery of course. 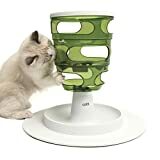 While I’ll happily give other cat feeding toy products a go, and I most certainly think feeding meals with feeding toys is something I’ll always be doing considering how dramatically toys have slowed down Avery’s eating, I’m always happy to have this food maze sitting around in my house – the perfect mealtime feeder to fall back on just in case nothing else works quite as well.